Congratulations! You’re getting married! And likely considering planning a Paris elopement or wedding in France, which is how you’ve found yourself here. We’re happy to pass along some tips and pointers to get you headed in the right direction. Planning a wedding is known to be stressful at times. Planning a destination wedding adds even more logistics, and planning a wedding in another country can feel overwhelming at first. This is why it’s so important to surround yourself with amazing vendors! They’ll help to alleviate your stress points. We have a curated list of professionals for you to reach out to for guidance. (Obviously, we can help you with all of your photography needs!) Click Here for our planning page. 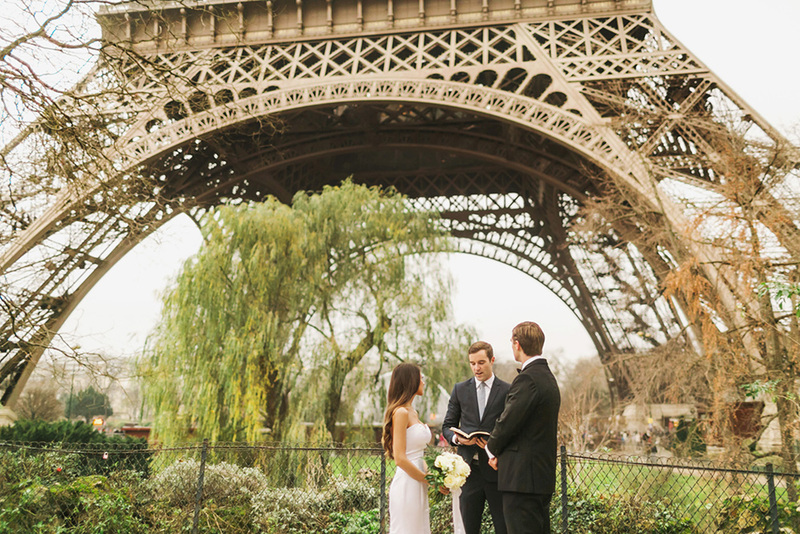 A few important items to note about getting married in Paris or France. First, if you are wanting a chateau style wedding you likely won’t be in Paris for that, as most chateau weddings take place within a couple hours of Paris, or even in the South of France, Provence area, etc. If your wish is for a Paris elopement, couples often select a public space or one of the fancy hotels such as the Shangri la or The Plaza. Most public spaces, such as the areas around the Eiffel Tower and some of the parks, do not require that you reserve space. This certainly helps to make things easier, but you should verify this is true of the location you choose. I highly recommend that you do work with a planner to help you navigate France and all the logistics that will need to be planned from afar. Trust me, your entire wedding experience will be infinitely better because you did, and you’ll thank me later! Now, about the legalities of marrying in France. Well…this one is a bit trickier. In France, everyone is required to wed first at their town hall (or ‘mairie’ in French) in a civil ceremony. And…you’d have to show a minimum of 40 days straight of residency before being allowed to do this. So…I don’t want to burst your bubble, it is possible, but in all honesty, probably not worth the paperwork and headaches involved. The French love their paperwork! It’s certain to prove challenging to say the least, and without a doubt, I would secure assistance if you do have your heart set on going this route. However, in our experience, most of the weddings we have photographed here, the couple weds in their home country in a legal ceremony before (or after) their ceremonial I do’s in France for the most romantic of locations and often their own personalized vows. Speaking of vows, one of my favorite wedding officiants here is Laura Montorio with The Paris Officiant. She is a true gem! She speaks perfect English, but can speak German and French fluently with the most lovely accent. And can even incorporate parts of the ceremony in Italian, Spanish or Chinese. In my opinion, she’s the perfect addition to even the simplest Paris elopement or wedding. I would be remiss if I didn’t mention a touch about photography since that is our specialty. We are huge fans of the early morning light. The light is soft, romantic, and dreamy in the early hours. The added bonus is that the earlier you schedule your ceremony/photos the fewer tourists that will be out and about in your backgrounds. 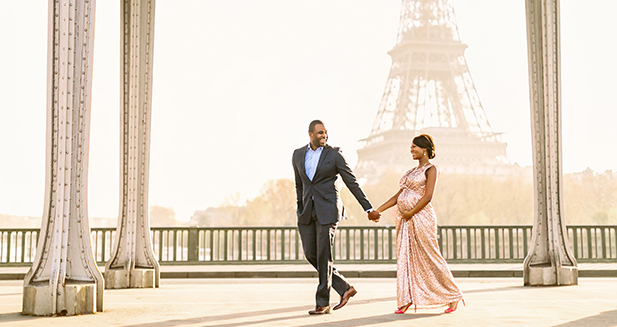 A sunrise ceremony will have you feeling as though you truly have Paris all to yourselves! If photos are of high importance to document your Paris elopement, you can plan to take photos in several of your favorite locations and easily spend 2-3 hours hopping around Paris enjoying your newlywed status while having it all documented. A fun add on could be adding one of the 2CV cars or a chauffeur to take you around. And by the end of all this fun, you’ll be ready for brunch at a cozy Parisian restaurant. Your planner, or our friends at Savoir Faire Concierge can help make suggestions and secure reservations for you. We hope you’ve enjoyed our quick and simple guide to get you started! We’d love to be a part of your celebration! When is your date?! Please click here for a fun polaroid camera tour — could be fun for yourselves or your guests! And ask us about our luxury picnic set ups as well! More info coming soon!